This child has been cracking us up lately! Two is such a fun age--Jonah is no exception! Jonah is really developing his sense of humor and talking so much--he has some great things to say. I thought I would share a couple of his funnier moments from today! At dinner tonight I was doing my best to be stern as I told Jonah to finish up his quesadilla. I was giving him the "mom look" and everything. When I finished talking, Jonah looked up at me and in this really high pitched voice he said, "Mommy, I miss you VERY much!" I tried so hard to keep a straight face (and I was doing a pretty good job of it too!) until I looked across the table at Sam. He was turned completely around, looking out the window with his shoulders shaking....because he was laughing so hard. Round 2: Jonah has this little monkey back-pack that he plays with every day while I'm showering and getting ready for the day. It goes the same every day. He puts some little trains and cars in it and then asks me to help him put it on. Then he tells me he's going to work. P.S. I just noticed that my husband has a lovely new post on his blog, Lazy by Nature. He does love to get comments, so if you have a minute and need a laugh....stop on by! I may have mentioned that my husband was gone for ten days last week. He and his brothers all went in together and took their dad to Canada for an amazing, once-in-a-lifetime (yeah, right--until next year!) fishing and camping trip! Some of Sam's fondest memories from growing up are of fishing with his dad, and especially the annual trip up into Canada. Here's the boys having a 'shore lunch' one day. It's the only picture we have with all of them in it--didn't it turn out great? They would spend all day on the water, but they'd find a nice spot to take a break from all that fishing to eat. 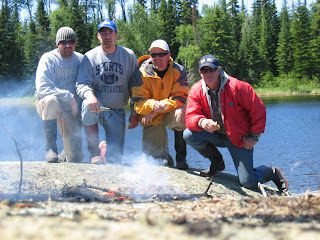 They had camp fires and roasted hot dogs every day. The guys really had a wonderful time. They caught WAY more fish than they could count (we're talking hundreds! ), had decent weather, played a lot of cards, and had a lot of fun! We're a little short on pictures (as Sam was the only one who brought a camera), but here's a taste of their trip. 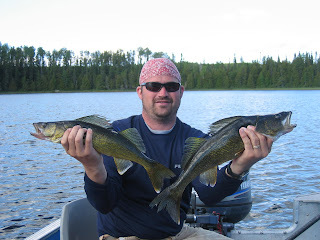 The picture below here is Sam with two fish--because he and Jon were in a boat together and caught nice walleyes at the same time! The boys are watching "Finding Nemo" tonight for their Friday night movie. One of their favorites, and one I actually enjoy watching with them! They have little chairs set up in right in front of the tv (with a big picnic blanket spread out underneath them!) and they just finished their pizza and moved onto popcorn. H: "Jonah, I love you." H: "But I really love you." H: "You're my favorite brother ever!!" I think these are the sweetest two boys on Earth! They certainly do make my heart happy! I've had more time on my hands than I expected this week....Sam is gone on a fishing trip with his dad and brothers, so I expected to stay quite busy. Keep the boys occupied, and they have less time to notice they miss their daddy! However, I didn't plan on having an eye infection that makes me look like I took a punch in the face. Anyway, the point of this post was really to show you all what I've been working on this week with my unplanned free time! I finally got the nursery done! It was a process--I really should have posted 'before' pictures, but the room was such a disaster that I didn't even take any! This first picture shows the border that I painted around the room (the middle is a repeated stamp of a butterfly and three little flowers--I know it's hard to see). Also I put up a cute little butterfly light switch cover. The crib bedding was given to me by my wonderful sister-in-law Beth....it's so pretty and girly, flowers and lace! This next picture is just a show-off picture....of the beautiful changing table that Sam made for us! He actually made it for me when we were expecting Henry. There is a foam pad that goes on the lower part (where the two baskets are sitting), but it's up in the attic and I didn't want to make the trip up there just to get it into the picture! Don't I have a talented husband? He amazes me sometimes with all of the skills he has. And this last picture is just to show the pretty window treatment that matches the crib bedding. Isn't it pretty? I feel so blessed to have been given such nice things--we never would have bought anything this nice! :) Thanks again, Beth! Almost forgot! I really, really wanted a glider-type rocking chair during my first two pregnancies. Someone gave us a lazy-boy recliner (the one in the top picture) to use, so it wasn't really practical to spend money on a different chair. The thing is that Sam and I both spent time sleeping with new babies in that chair and it is NOT comfortable! We both have stories of days and days of sore backs or stiff necks from sitting in that chair and rocking our little ones. I'll be sure to post a picture of that when it's finished! I know this isn't the most exciting blog material, but this past weekend we got over six inches of rain in two storms (basically in a 24 hour period). I grew up in Seattle, so I thought I knew all there was to know about rain.....but Texas is showing me a thing or two! There were areas around us that were having flash floods and an entire town was pretty much flooded (at least four people died in Gainesville this week), so I feel very fortunate that we just had flooded yards. and a close up of a newly created (at least for the weekend!) waterfall. The boys thought this was great! Henry thought we were out for a scenic drive! and this one is just a picture of the road going toward my house--the brown/red-ish ribbon to the left is a river of water where there is usually just a soft, grassy shoulder. A day in the life of the boys . . .
Start the day by getting the paper for Mommy. Can't forget to put on a pair of her socks--it might only be 70 degrees outside (wouldn't want to get cold!). Next, get all the gear you might need and head outside! Don't forget your swimsuit! Spend some time blowing bubbles--always a good way to spend time! Ice cream is a good way to cool off when it's hot . . .
And always finish up with a bath--end the day clean! I LOVE BEING A STAY-AT-HOME MOMMY!!!! Sam and I have lived in three different houses in the span of our marriage and had wonderful neighbors in each of the places. There are people that we lived near in our first two homes that we will forever be friends with--and they are all people we would probably not otherwise have had the opportunity to know. It's interesting who God puts in our lives, isn't it? When we moved into our current house, there were two nice neighbors already living around us (a retired couple and a single lady who is a doctor--bonus! ), but the house right next to us wasn't built yet. Sam and I prayed often (and Henry really joined in too!) that we would have friendly neighbors that we would get along with, and that they would have kids. It just seemed like the perfect situtation, so that's what we continued to ask for! A month or so ago, a nice Christian couple with two kids moved into the house next door to us! They have a little girl and a boy who are just a few years older than our boys. The kids all get along great, and they've already formed friendships! The parents are really great people too and we're getting to know them pretty well. But first, a flash-back picture! This was taken in July of 2005--camping with Dave and Mary Beth in Montana! I thought it might be fun to share another recipe for anyone who is interested! This one is for a dessert that my husband requests often (it's probably his favorite! ), but it makes quite a bit.....so I usually wait until I have a crowd to feed! Anyway, it's really easy to make (and oh-so yummy) and it looks really pretty when it's served! Since Sam is going to be gone over Father's Day, we spent the day with his parents and Jon and Kelly--and I took this dessert out to share. Spray 9 x 13 pan with non-stick cooking spray. Line bottom with whole graham crackers. Beat chocolate pudding with 1 cup milk; beat in ½ container Cool Whip. Spread over crackers. Place another layer of crackers over pudding. Beat vanilla pudding with remaining cup of milk; blend in remaining Cool Whip. Spread over crackers. End with final layer of crackers. Cover with chocolate glaze and refrigerate overnight. Melt butter in water, then add sifted cocoa and stir until smooth. Combine with sifted powdered sugar and vanilla. Spread over cake. Well, I'm not sure. I haven't actually been anywhere. Just busy. And I've been pulling myself away from the computer more and more. It just seems to eat away my time.....reading news, reading blogs, commenting on blogs, uploading and organizing pictures, looking up random facts because I'm curious about things, shopping....and so on. If I used to comment on your blog, and you notice I haven't recently....that is why. Just a little break. I'll still read the blogs I've always read, but I'm just not taking so much time to comment. Anyway, this picture is from a while ago, but I kept forgetting to post it. Last summer we bought a cheap little table and four chairs set to use on our patio. It was a nice little addition to our back porch. It started out with white-ish colored cushions. The only problem was that last summer our backyard was unfinished and covered in RED DIRT. Then it would rain and we would have RED MUD. Lots of fun for the boys, a little less for me. I mopped the kitchen floor almost daily. It was a little ridiculous! Back to the point. By last winter (when it's REALLY nice to be eating outside around these parts!) I noticed that my "white-ish" colored chair pads were now mostly red and streaked with dirt. They weren't the kind you can just throw in the wash either. They were actually so bad that we were putting towels down before we sat down! Ever notice how something can trigger a memory, and it instantly transports you back to a different time? Sam and I both had this happen yesterday--at a track meet. Teen Mania put on a track meet as part of their celebration weekend, and Sam helped out with it (the boys and I just went along to watch!). Sam and I didn't know each other in high school (we were a number of states away from each other! ), but we both were runners. We both ran track (long distance races) and cross country. (FYI, that was more than ten years ago.) Yesterday, when I walked into the stands, I heard the announcer letting the athletes know which races were coming up, saw the kids stretching and warming up, heard the starter's pistol going off, watched the runners take off around the track.....it only got worse when I stepped down onto the rubber track. It really took be back-whoa! I could have been in high school again. It was a very surreal feeling! Sam had the very same experience too. His was really related to the smells of the track and field, watching everything unfold.....but he definitely was taken back too! Anyway, I know this is a random post, but it's on my mind. I think I may have just discovered something that has been missing in my life. I'll keep you posted--it may be a little while, as right now at seven months pregnant doesn't seem like the right time to revive my running career! Henry made my day at one point too. We wandered around for a while, just letting the boys take it all in. When they decided they wanted to sit down, I let them pick a seat. Henry led us way down to the front of the stands and plopped himself down. They were just lining up the guys at the starting line to run the mile. I explained to Henry what was going on, and he asked, "Mommy, why don't I ever get to run in races like that?" I told him when he's older he can--and he was SO excited! :) I do live in the moment most of the time, but I really look forward to the days of cheering on my children in sports!